(HQC-case) Our first factory founded in 2006, we only make different styles of aluminum cases at the beginning. Our customers satisfy our higher quality and more competitive prices, they order more and more aluminum cases and they introduce their friends to us too. It helps us to develop fast. In 2009, we begin to make pure aluminum cases. It is an interesting story for us to develop pure aluminum cases. Our customer needs us to make a sample at first. We did not consider it will take so much time. In 2010, we begin to invest to make Pelican cases. We develop it with our partner. 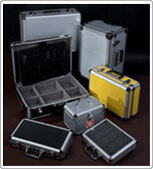 Now , we have so many different styles of Pelican cases. HQC-Case will bring more and more happiness and surprise to you. When the customer confirmed the sample, 4 months have passed. It is really a beautiful and happiness remembering for us. Whenever you or your friend need the cases, please do not forget to contact us, we will supply best service for you. Higher Quality and more Competitive price cases are waiting for you.